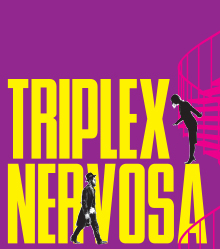 In his recent review of Marianne Ackerman’s Triplex Nervosa, Jim Burke comments on the plot of the play, and explains both the comedic and artistic qualities which it successfully displays. The play follows a young woman who has maxed out her credit cards and put a promising music career on hold to buy a triplex in Montreal’s trendy Mile End, only to find that the charming but stubborn Hassidic previous owner and her motley crew of tenants won’t co-operate with her needs. When she and her handy-man conspire to make one particularly difficult tenant’s life less comfortable, things go terribly wrong. Moreover, the play has a prominent musical component and includes the music of Mile End musician Patrick Watson. In addressing the play’s mood and characters, Burke explains its feel-good confection: the ability to embrace the comedic genre all the while offering characters which are rounded and well-crafted. Furthermore, he explains that there is a strong artistic component in the play, which comes out alongside the many humorous scenes. Tagged with Centaur Theatre, Jim Burke, Marianne Ackerman, Montreal Gazette, review, Triplex Nervosa.